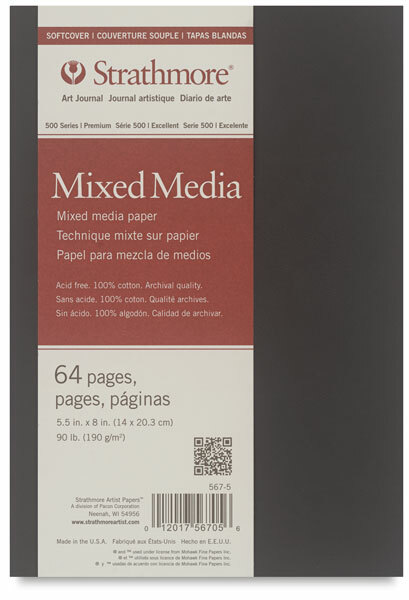 The Strathmore Softcover Mixed Media Art Journal holds 64 pages of a professional-quality paper with a durable vellum finish for drawing, and internal sizing to accept wet media. Excellent for watercolors, gouache, acrylics, graphite, pen-and-ink, colored pencils, markers, pastels, and collage, 500 Series Mixed Media paper is made from 100% cotton fiber and is acid-free, lignin-free, and archival. The velvety "softcover" is a rich, dark brown color, and the durable Smyth-sewn binding allows pages to lie flatter. 90 lb (190 gsm).